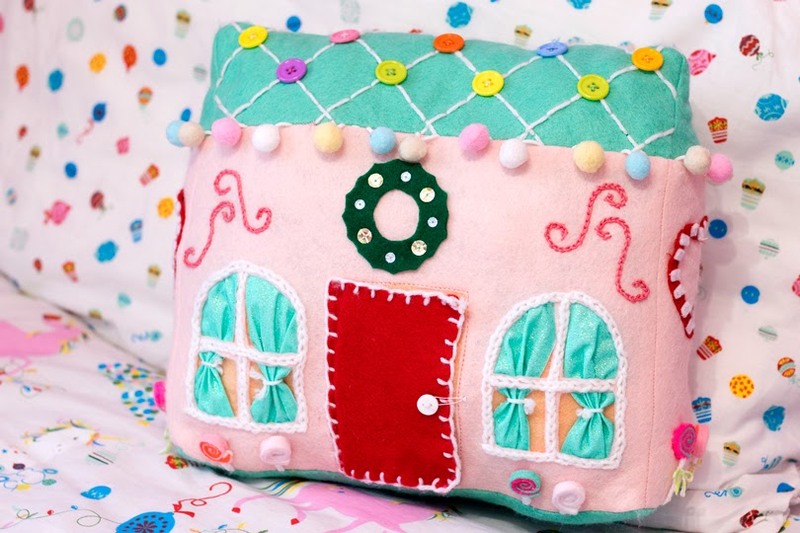 Last year we made gingerbread cushions, and this year we are making them these adorable gingerbread house cushions. Well, sort of. 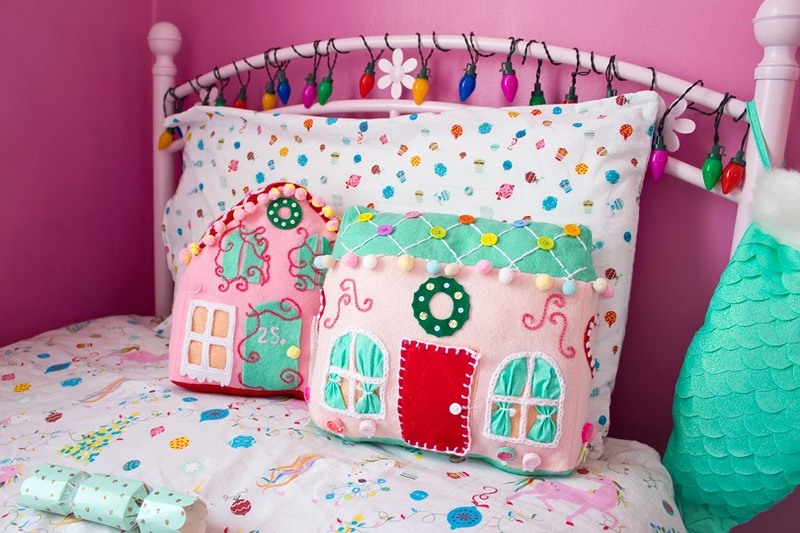 Those larger gingerbreads definitely won’t be fitting in these homes. 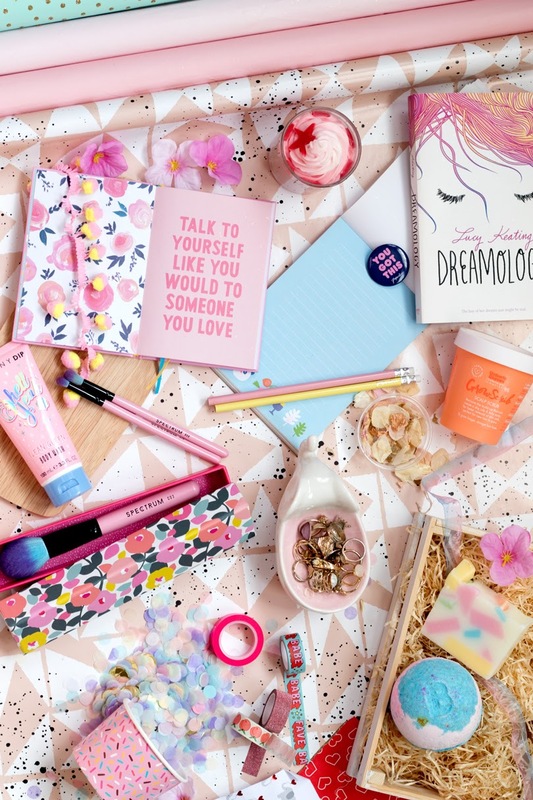 A fancy iced gingerbread house decorated in sweets and chocolates adorn our tables over the festive period, but if you’re more a crafter than a baker, you can furnish your decor with plush houses. Raise your hand if you’ve never made a gingerbread house... *raises hand*. 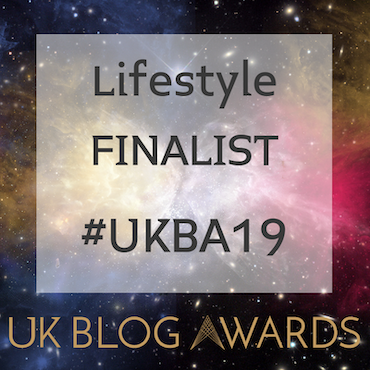 The more I write these blogmas posts, the more I realise I have missed out on a whole lot of traditional Christmas things. I'm not usually one to keep to tradition, but there are some things which I think I need to add to my festive bucketlist. These cushions are just my absolute favourite things. I was only supposed to make one gingerbread house but you know me - I had far too many ideas that would have been unacceptable (a design overload) for a single home, so I shared them between the two. These are not your typical gingerbread houses, but I’ve taken inspiration from the editable treats and bought those in using crafting materials. 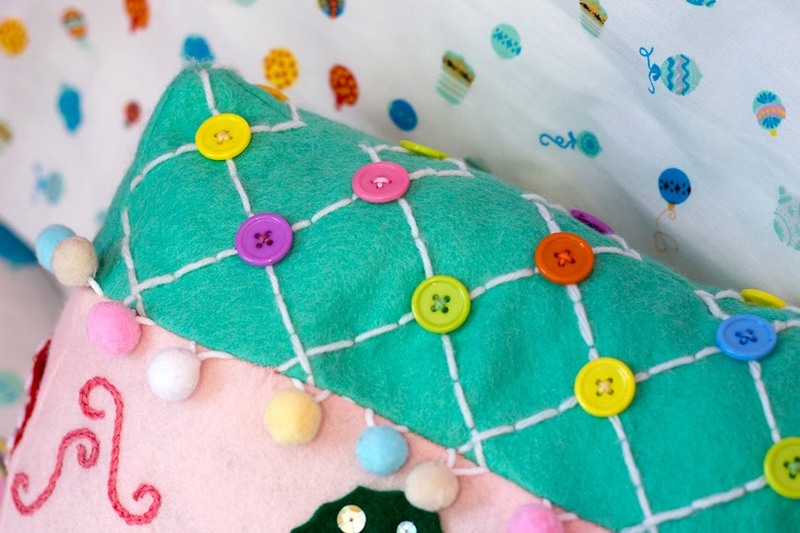 I'll do a little walkthrough of each cushion to help inspire your creation. 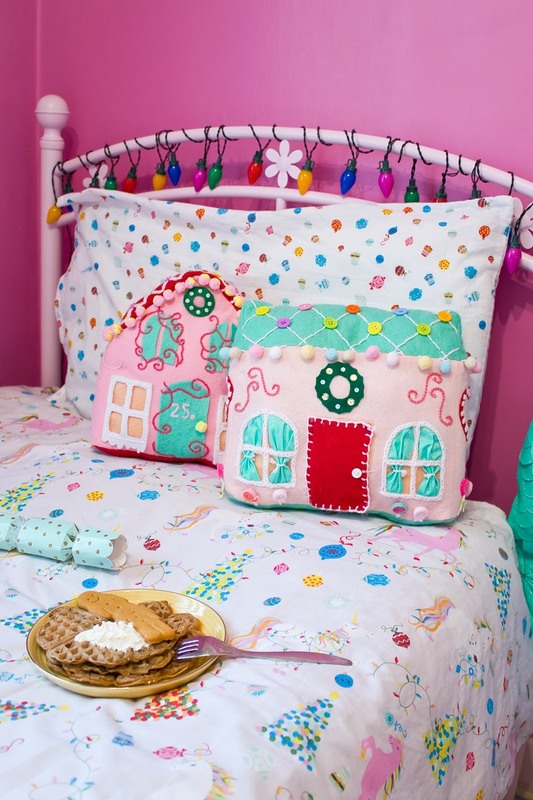 The first house would be more of a traditional but pastel gingerbread house. 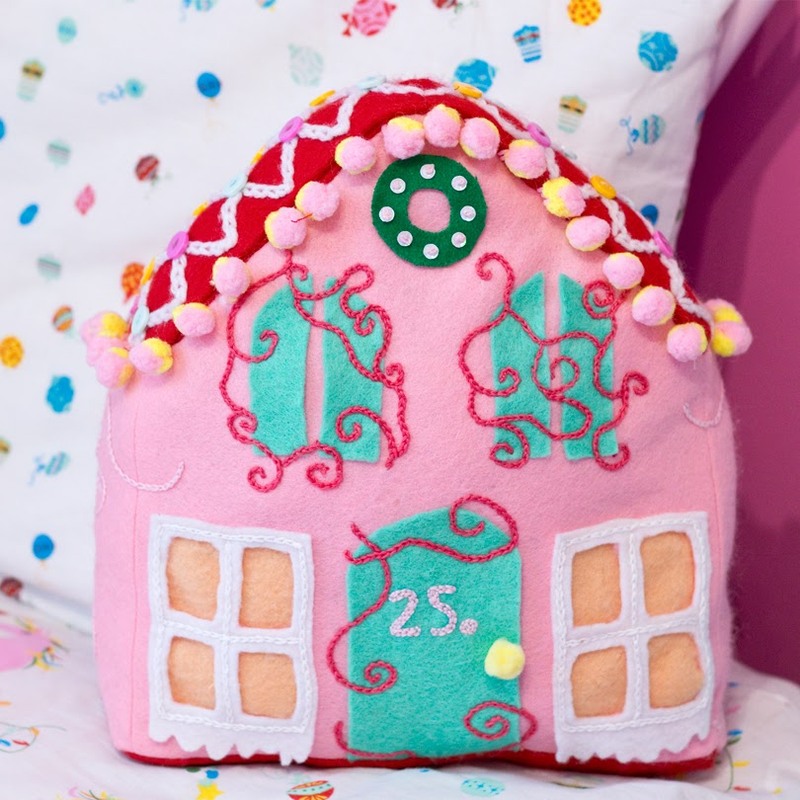 The roof was inspired by the piping and sweet decoration of which I used pastel buttons and a white yarn. 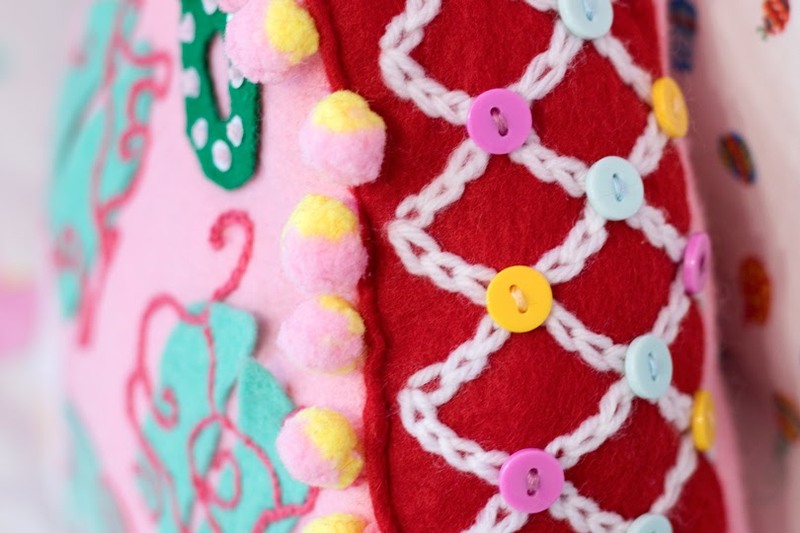 I used a thick chain stitch throughout to continue the royal icing piping theme. I cut into the main fabric to create the windows and doors. Through the windows, you can see the glitter curtains, and I used a tan felt to cover the gap. Unlike the windows, you can actually open the door! I attached an elastic thread to hold the button (the doorknob) closed. Behind the door is a typical festive scene with a tree and presents. This is optional, but I'm such a huge fan of details. Talking of details, I have made those felt sweet flowers by rolling two strips of felt and sewing them secure. I finished them with plaited yarns and a twine bow. I also stitched on candy cane hearts and pom-pom Christmas lights across the top. The second house is far from a gingerbread house, more of a festive castle? I used the same technique for the roof, just changed the stitch from a line to a chain. 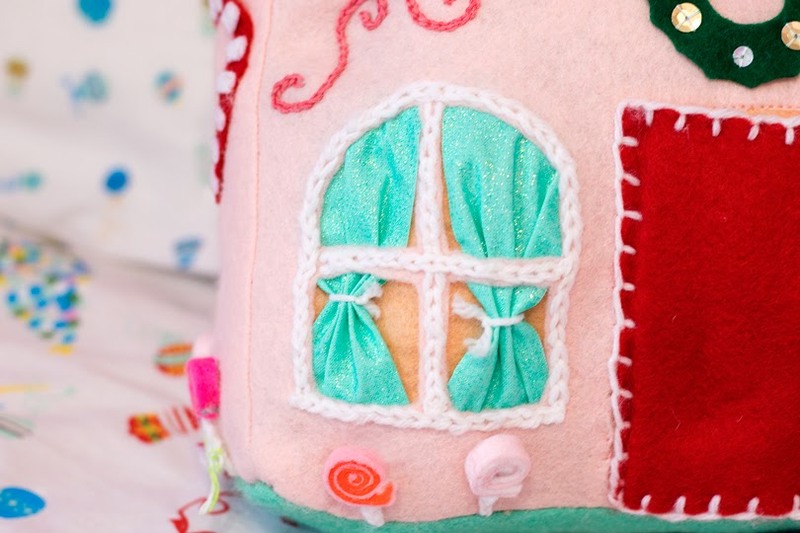 A vine inspired chain stitch intertwines over the door and upper windows - a very damsel in distress/princess locked in a castle kind of vibe. There is a blanket of snow around the windows, and again with pom-pom Christmas lights. This cushion is much simpler, but I also like it that way. ...they can be used all year round. I know, I'm working with all the seasons here. All the fabric I used (except for the curtains) was felt. 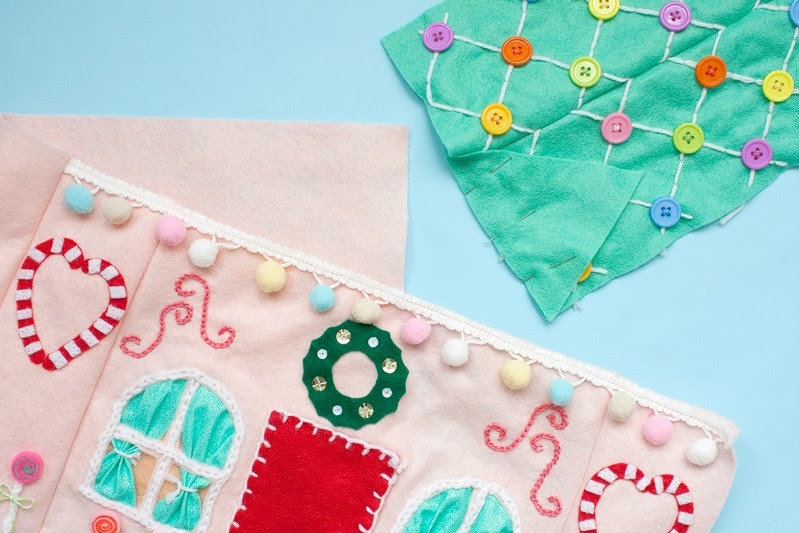 Felt is the perfect crafting fabric as you don't need to worry about fraying or grainlines. 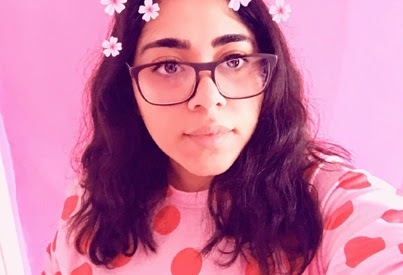 I also have another crafting project coming up at the start of next week, so make sure you save some of your felt for that. Using a large piece of paper, sketch and shape your house. The measurements for my house is 27cm x 18cm for the main front and back, 18cm x 7cm for the side panels, 27cm x 7.5cm for the roof, 7cm x 7.5cm for the roof side panel, and 27cm x 7cm for the bottom panel. Add in your windows and doors too. I created mine from paper before I went to fabric to make sure I had the right shape and size. Don't forget to add a 1cm seam allowance to all your pieces. 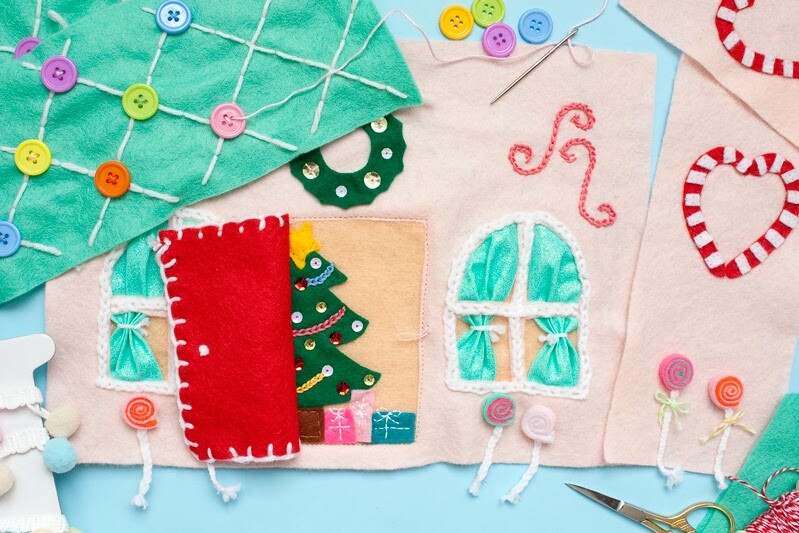 Once you have cut all your felt pieces out, sew on any embellishments you like, such as hand embroidery, buttons, felt shapes, a felt wreath etc. 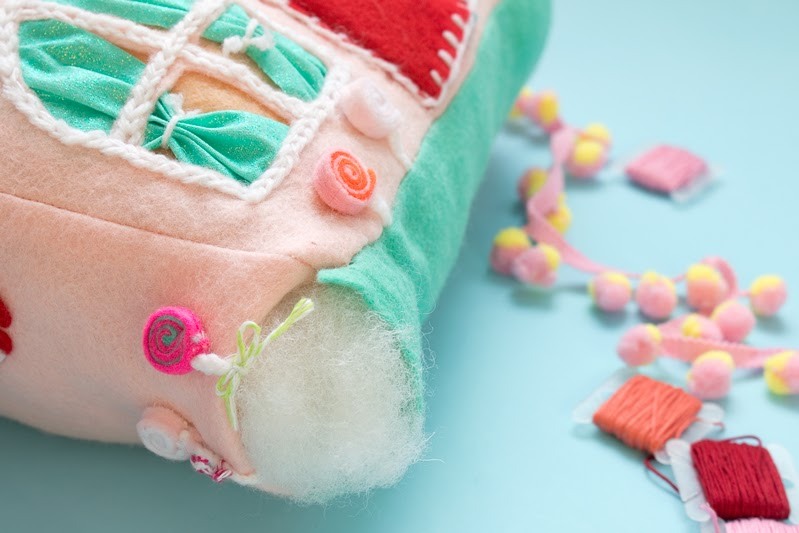 Once you have finished making all your felt pieces beautiful, it's time to sew them together! 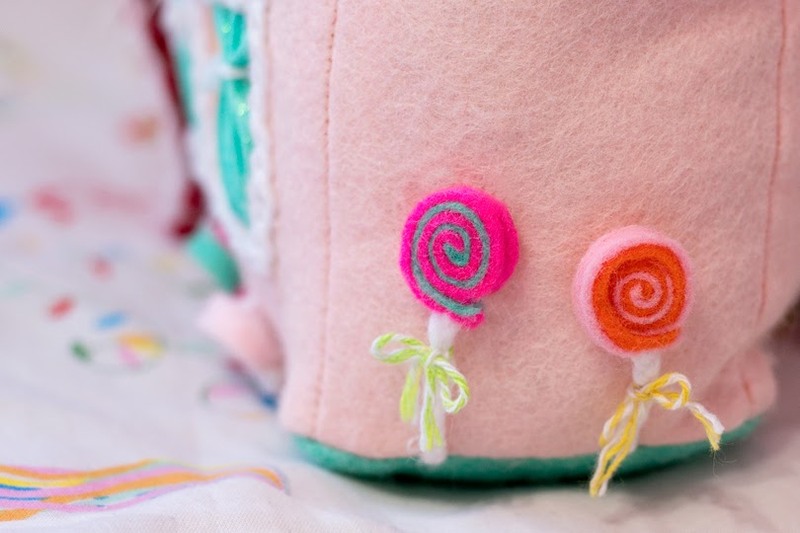 The shape of your house and your sewing technique will determine how it's best to construct your house, but for mine, I sewed the main front and back to the side panels, then attached on my pom-pom trim before sewing the last side down close, which will create a box shape. I then sewed the roof together and attached that onto the main panels making sure everything was lined up in the right place and sewed those together. Last, attatch the bottom panel. 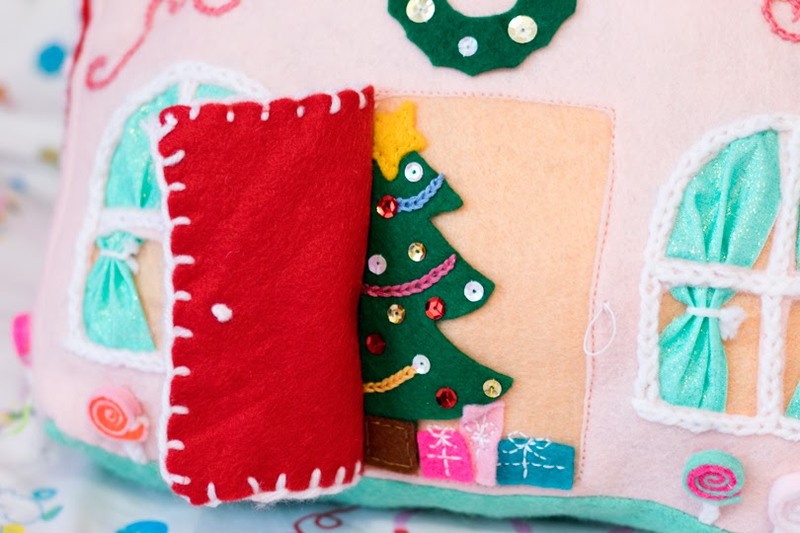 Turn your gingerbread house inside out to sew this on correctly, but leave a gap big enough to add your stuffing. 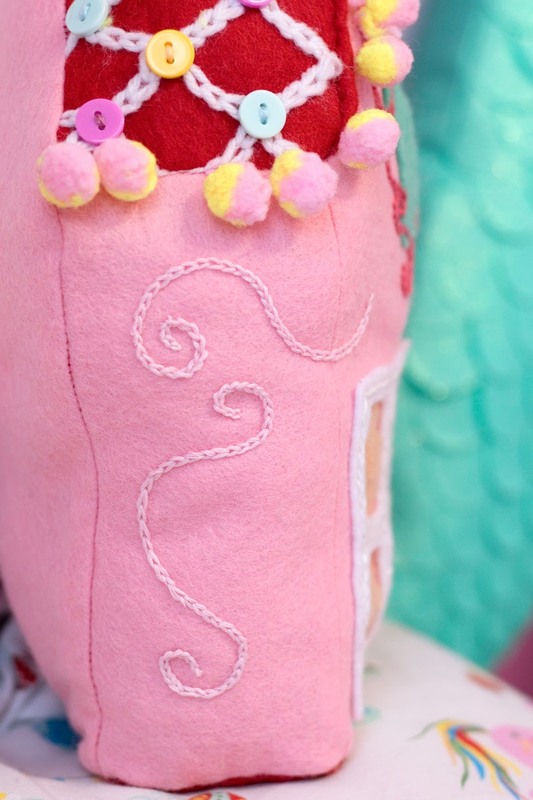 Once you have stuffed it, use an invisible stitch to carefully hand sew the opening shut. I think cushions are one of my favourite decor pieces to makes. If I were to open a shop, cushions would definitely be one of my first items to sell. Let me know in the comments below which gingerbread house you prefer; a pastel traditional house or a castle inspired house. Make sure you check out my advent calendar to open the next door tomorrow.